Bathed in garlic, butter, and white wine, this Easy Shrimp Scampi Recipe takes just 10 minutes to cook start to finish. 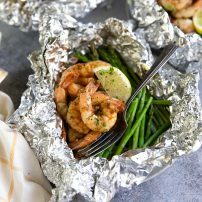 Enjoy this restaurant shrimp scampi with a loaf of crusty bread, with your favorite pasta noodles, or, keep it low carb and serve with zucchini noodles, asparagus, or steamed cauliflower. Before I just too far ahead of myself with this undeniably delicious and addictive recipe, I thought I should clear something up real fast. Scampi is actually a species of lobster…not a sauce and definitely not a shrimp. Considered a delicacy, Scampi, also known as Dublin Bay Prawn or Norway Lobster, is found in the Mediterranean and northeastern Atlantic, from North Africa all the way up to Norway and Iceland. Roughly the same size as large crayfish, Scampi is closer in taste and texture to lobster than prawns or shrimp. Dublin Bay Prawns, like any other shrimp or lobster, may be prepared using several different methods, including in with garlic butter, dry white wine, and sprinkled with parmesan cheese. What then is Shrimp Scampi? From what I understand, Shrimp Scampi is an Italian American name given to shrimp served in a garlic, butter, and white wine sauce. With several variations, you may find a Shrimp Scampi Recipe that is breaded, baked, served with brown butter, tossed with noodles, or mixed with cheese. The recipe I have for you today is Shrimp Scampi at its most basic level- delicious, juicy shrimp tossed and cooked in butter, white wine, loads of garlic, and a little bit of fresh lemon juice. As mentioned above, the best wine to use in this recipe is a crisp and dry white wine, such as Pinot Grigio. I do not recommend using any of the sweeter white wine varieties such as Moscato or Reisling. First and foremost, gather and prepare all your ingredients. This is important because once you get cooking things move pretty quick. Heat a large skillet over high heat. Add the olive oil and 2 tablespoons butter. Once the butter has melted, swirl to coat the bottom of your skillet. Add the garlic and sauté until golden and fragrant. You’ll want to watch the garlic, you guys. If the skillet is too hot, reduce the heat so that it doesn’t burn. The best thing is to continuously stir your garlic for approximately 30 seconds. Add the shrimp to the skillet and season with salt and pepper. 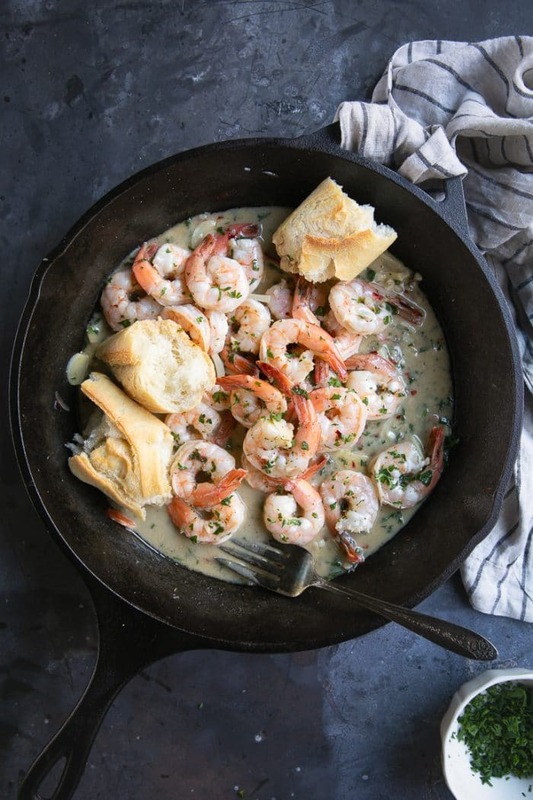 Now, in this version of shrimp scampi we are not cooking the shrimp individually first, so all your shrimp may not have their own space in the skillet when you initially put them in. This is ok. Simply spread them out as much as possible and allow them to cook for a minute or so before mixing with the garlic and continuing to cook for an additional minute. With the skillet still hot, pour in the wine and sprinkle with crushed red pepper (if using). Simmer for 1-2 minutes, stirring occasionally, until shrimp are fully cooked. Do not overcook the shrimp. Stir in the remaining butter, lemon juice, and fresh parsley. Remove from heat immediately and serve. 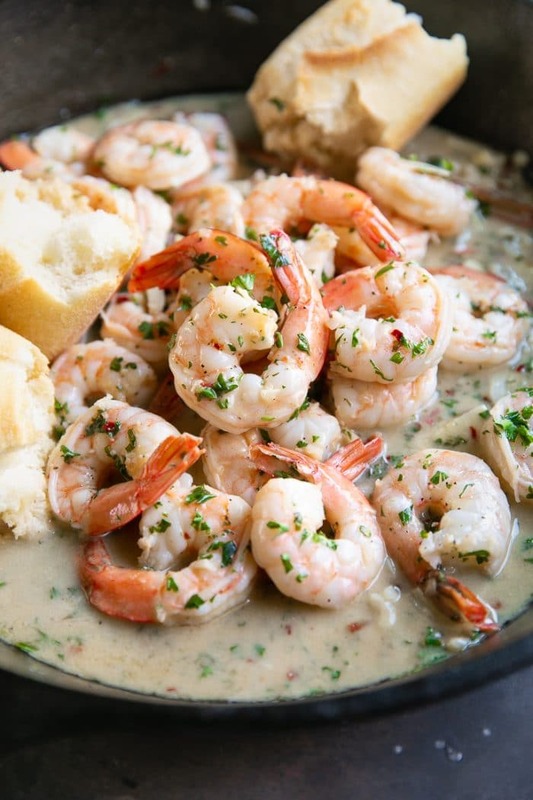 There is more than one way to make Shrimp Scampi. However, this is my go-to whenever I want delicious restaurant quality shrimp without having to leave the comfort of my own home. Use fresh garlic. You guys, this is a must for this recipe. As one of the most important flavors in this recipe, fresh is best. The same applies to the lemon juice. In other words, use fresh lemon juice (not the bottled concentrated version). 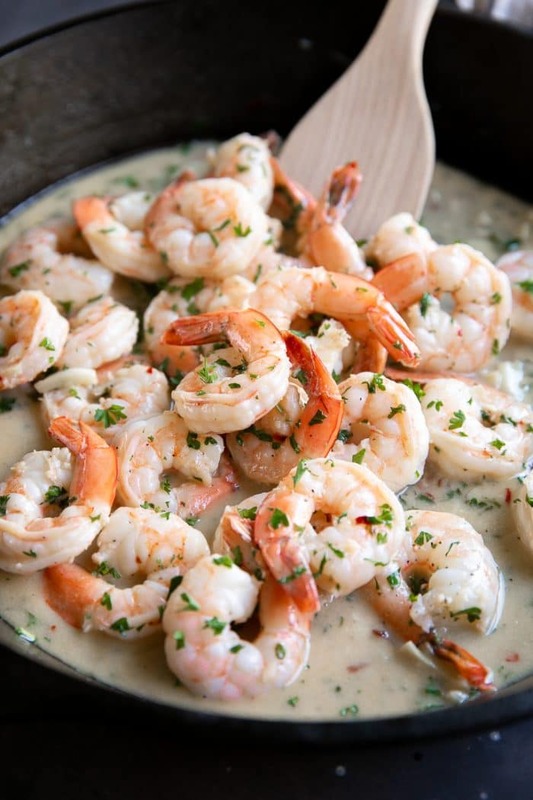 If you prefer to cook the shrimp separately from the garlic butter sauce simply add the shrimp to a hot skillet with butter or oil and cook each side for approximately 2 minutes, or until fully cooked. Remove the shrimp to a clean plate and prepare the sauce as outlined in the recipe. The crushed red pepper is optional. If you are sensitive to spicy foods, I recommend reducing the amount by at least half. If you choose not to cook with wine, you may omit from the recipe altogether or substitute with chicken stock or fish broth. Big jumbo (thawed) shrimp or prawns work best in this recipe. Remember, they will shrink during cooking. I like to leave the tails on, especially when serving as an appetizer, but feel free to remove the tail for easier eating. 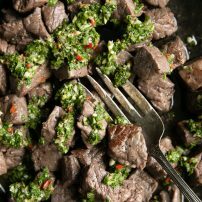 Since this recipe only takes 10 minutes to make (at most), I highly recommend having everything prepared and measured before you start cooking. 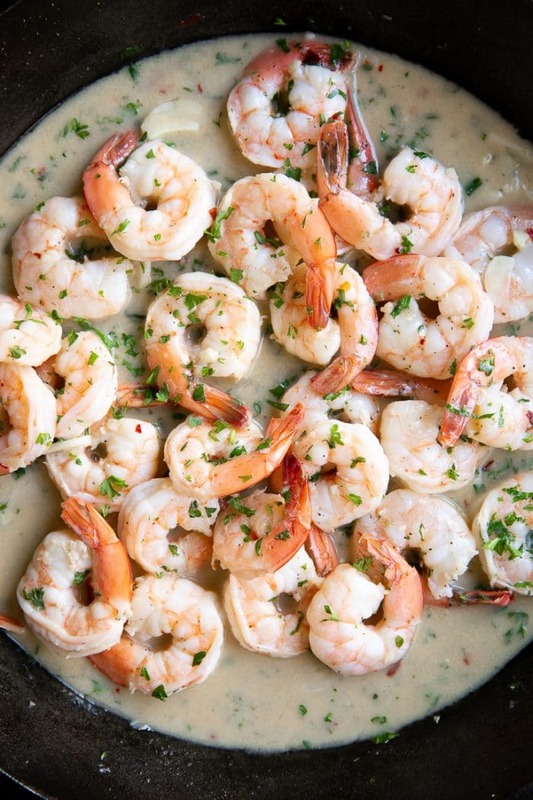 When adding shrimp to the pan, try not to include any of the water that collected when the shrimp thawed. Shrimp Scampi is incredibly versatile. As such, this mouthwatering shrimp recipe can be served as an appetizer, snack, side, or main course. As an appetizer or light lunch, I recommend serving with French bread or garlic bread. The sauce is perfect for dipping and the shrimp makes a fabulous source of protein. You will commonly find Shrimp Scampi served with pasta. A personal favorite, few things in life taste better than buttery garlic covered noodles served with fat, juicy shrimp. If you’re looking for fewer carbs, swap the pasta for zucchini noodles and serve with a simple green side salad, Sautéed Brussels Sprouts, or Roasted Cauliflower. If you try making this 10 Minute Shrimp Scampi Recipe, please leave me a comment and let me know! I always love to hear your thoughts. Chopped Shrimp Salad Recipe with Cilantro Lime Vinaigrette <—so much flavor! 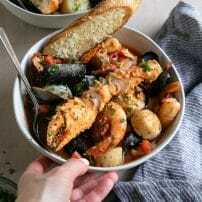 Jambalaya Recipe (How to Make Jambalaya) <— personal favorite! Easy Shrimp and Asparagus Stir Fry <— low calorie! DON’T FORGET TO PIN AND SHARE THIS SHRIMP SCAMPI RECIPE AND ADD IT TO YOUR NEXT WEEKLY MEAL PLAN! Bathed in a garlicky butter and white wine sauce, this Easy Shrimp Scampi Recipe takes just 10 minutes to cook start to finish. Heat olive oil and two tablespoons of butter in a large skillet over high heat. Once the butter has melted, add the garlic. Sauté the garlic, stirring continuously, until golden and fragrant (approximately 30 seconds). Add the shrimp and sprinkle with salt and pepper to season. Cook for 1 minute, or until just starting to turn pink, then flip and cook for one minute more. Pour in the white wine and sprinkle with crushed red pepper. 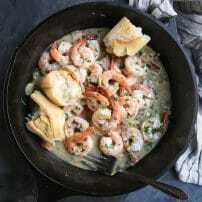 Bring to a simmer and cook the shrimp for 1-2 minutes or until the shrimp are fully cooked. Stir in the remaining 4 tablespoons of butter, lemon juice, and season with fresh chopped parsley. Best served immediately. 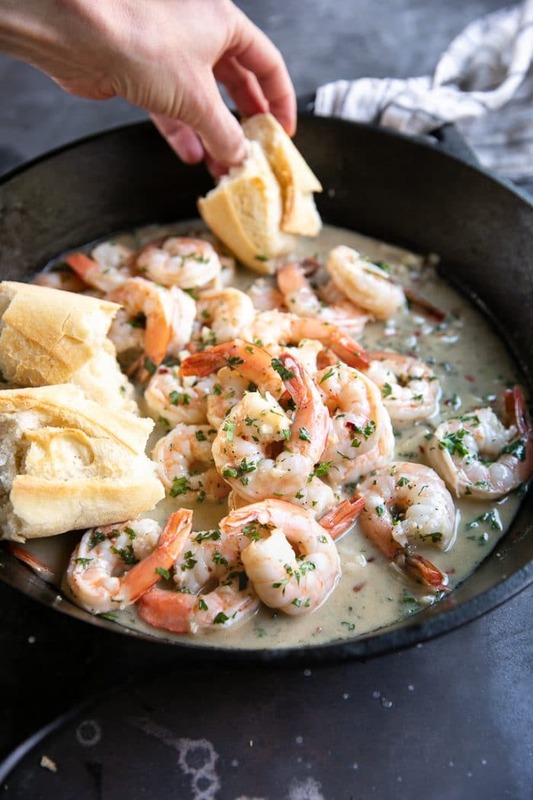 If you prefer to cook the shrimp separately from the garlic butter sauce simply add the shrimp to a hot skillet with butter or oil and cook each side for approximately 2 minutes, or until fully cooked. Remove the shrimp to a clean plate and prepare the sauce as outlined in the notes. Big jumbo shrimp or prawns work best in this recipe. Remember, they will shrink during cooking.